Lily is a printmaker and painter who, nestled among the trees in a bush property by the sea in southern NSW, uses paint mediums and mark making processes to create works that explore natural structures in their most minimal form. Wildflower is an exploration of concepts based around life, death and everything before, during and after. In the series she references historically relevant colours and simplified floral forms as a means of understanding cycles of nature, and our connections to landscape; particularly our presence in them during life, and perceived absence in death. “Purples are historically used to represent mourning and loss. 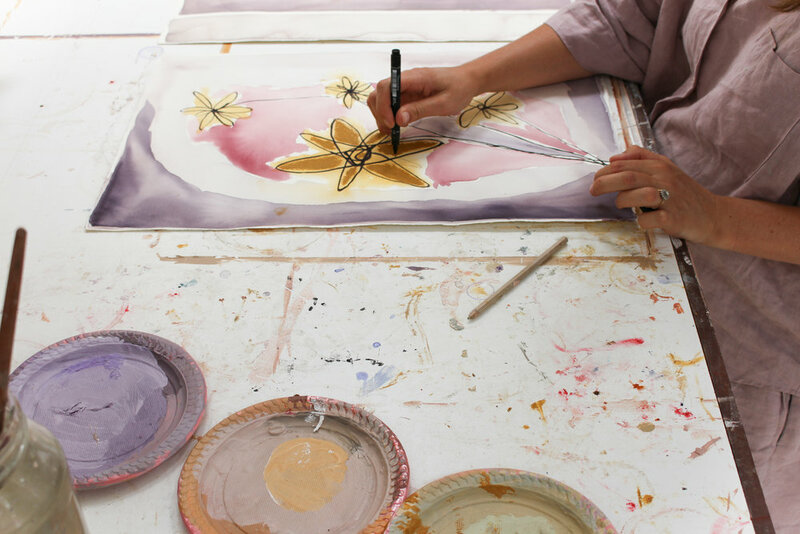 I’ve used clay, moss, ochre and coral mixed with mauve, heliotrope and lilac to represent the cycles of nature and life,” says Lily of her colour selection. The series is a collection of six works made from mixed medium of acrylic, gouache, oil stick crayon, chalk pastel and pencil on canvas. "The titles have come from a combination of songs and conversations with loved ones. They form a tribute to my dear, wild - sometimes badly behaved - friend," Lily said. Since completing a Visual Arts Degree in 2013, Lily has exhibited throughout the country and her work has been featured in The Design Files, IN BED Journal and The Daily Imprint. Wildflower will exhibit at Newrybar Merchants from 6th February - 6th March 2019.